These are all real (and slightly alarming) headlines that pressure brides and grooms to look “perfect” by dropping major pounds before their wedding day. And brides aren’t alone in feeling like they need to slim down before walking down the aisle: A survey of 163 grooms-to-be found that 39 percent were attempting to lose weight for their weddings. Research suggests that the pressure to lose weight may have negative consequences after the wedding: A 2014 study found that brides who were told to lose weight before their wedding “gained significantly more weight post-wedding” than brides who were not told to shed pounds before the wedding. 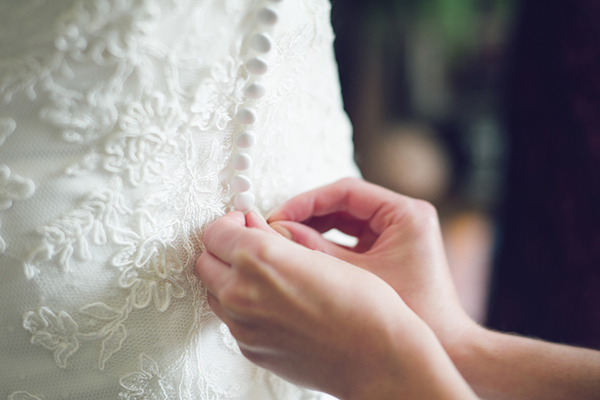 If you do want to lose weight before your wedding, it’s important to make sure you do it in a safe and sustainable way, so you can look and feel great on your big day — and beyond. Detox diets, juice-only cleanses, and other crash diets may offer promising claims, but quick-fix weight-loss strategies are typically extreme and unhealthy — and they can get in the way of what’s supposed to be one of the happiest milestones of your life. Diets that drastically reduce calories or cut out complete food groups can make you tired, moody, and unable to get through a workout. They may also prevent you from getting the important nutrients and vitamins your body needs. The solution: Take it slow and steady. “It’s generally recommended to lose one to two pounds per week,” says Rose Marie Ward, Ph.D., a professor of public health at Miami University in Ohio. A lot of wedding magazines talk about weight loss like it’s a must. Ignore the pressure to look “perfect” on your wedding day, and shift to a more positive body-image mindset. Setting a goal to get healthy, feel great, and lose weight is totally fine. Just don’t lose sight of what your wedding is really about. Benté’s biggest tip? “Start early. Find something that’s sustainable. Make it more a lifestyle shift.” Rather than waiting until the month before you say “I do,” the idea is to achieve your goals over time, so you don’t turn to drastic diet and fitness measures to lose weight right before your wedding. “Going on crazy, unsustainable diets paired with long, intense training sessions every day will only wear you out,” says Beachbody fitness expert Cody Braun. And when you get worn out, you can say “goodbye” to motivation. Starting early — say, right after you get engaged — will allow you to follow a nutrition and exercise schedule that includes rest and recovery days, which are key for building a strong, healthy body. “You don’t want to ramp things up excessively to the point of overtraining while ridiculously cutting calories just because you waited to the last month to lose that extra weight,” Braun adds. That strategy will most likely end up backfiring anyway, since the body tends to resist fat loss as much as it can when pushed to extremes. And while long-term goals are great when you want to keep your eye on the big picture, short-term goals can help keep you motivated and on target along the way. “If you strive to hit smaller goals every month, you are more likely to achieve them without injury, overtraining, or loss of motivation,” Braun says. To stay accountable, work out with someone — rope in your fiancé/fiancée, bridesmaid, groomsman, or a family member. Make healthy meals together. Challenge each other when someone isn’t feeling motivated to hit the gym. A buddy system can help you stay engaged when you’re tempted to make unhealthy choices. “That way, you have someone to back you up and support you,” Benté says. Admit it: How many times have you bought a smaller pair of jeans or smaller-sized dress to “motivate” you to lose weight? Did it work? Probably not. That’s definitely not something you want to do when you’re spending hundreds, possibly thousands, of dollars on a dress or suit. Bridal consultants advise against making rash sizing choices. Select a dress or suit that fits now; a tailor can always take it in later. “It’s easier to make it smaller than it is to make it larger,” says wedding planner JoAnn Gregoli, owner of Elegant Occasions by JoAnn Gregoli. “The number one reason folks give for not exercising is that they don’t have enough time,” says Lisa McQuade, M.A., a trainer and sport and exercise psychology professor at the College of Charleston in South Carolina. When life is already busy, and you add wedding planning to the mix, you may feel like there are even fewer hours in the day for exercise. But even though it may be stressful trying to fit in exercise when you have nonstop wedding research and meetings with vendors, remember that working out can actually help you manage it all. “Exercise can help you deal with stress in a positive way,” McQuade says. Figure out a plan that fits your lifestyle, then schedule the time to do it. Set your alarm early for a morning workout, or break it up and do shorter bursts of intense activity throughout the day. Speaking of exercise, jogging at a steady pace on the treadmill isn’t going to cut it. “If you’re looking to give it that extra push, try high-intensity interval training (HIIT), which has been shown to burn fat and build muscle most efficiently,” Braun says. HIIT burns tons of calories while you work out and elevates your metabolism for up to 72 hours afterward as you body repairs the micro trauma caused by your workout, and adds muscle tissue so you can better handle your next workout. Basically, muscle repair and growth requires a sustained increase in energy expenditure, and those processes are sparked to a greater degree with high-intensity workouts (like HIIT and weightlifting) than low-intensity workouts (like jogging). If you feel like you’re not seeing any significant changes, do something different. “Many people get into the habit of doing the same workout every day for weeks, months, or even years, and that can ultimately lead to a plateau, because your body stops adapting,” Braun says. Change up not only the type of workout but also the weights you lift, your lifting tempo, interval length, and variations of different exercises to see results. All calories are not created equal. Clean eating — more fruits and veggies and less processed and fried foods — can help you lose weight and feel energized to get through all those dress appointments and workouts. If you already eat pretty clean — say, 80 percent healthy foods and 20 percent less-than-healthy foods — but can’t get the scale to budge, Benté suggests bumping it up to 90/10. Research suggests that tracking what you eat and when — whether digitally or on paper — can help you hit your weight-loss goals. But don’t just mindlessly jot things down. “Notice your triggers and work toward modifying behaviors that lead you astray,” McQuade says. Just like it’s smart to ease into a manageable exercise routine, it’s a good idea to slowly and carefully make your diet healthier rather than shooting for a massive overhaul all at once. “Don’t go from fast food every day to salad every day — it’s not realistic,” Benté says. Instead, she suggests making small changes you can accomplish on a weekly or monthly basis. Since wedding planning can be stressful and time-consuming — and stress can lead to emotional eating or impulsive food decisions — meal planning can be one of your greatest weight-loss tools. Your day won’t be any less special if you don’t hit that magic number. While it’s great to set a goal number, don’t beat yourself up if you don’t make it there. “Don’t go crazy,” Benté says. “The whole point is to have a good time and enjoy the journey — that extra five pounds isn’t going to make or break your day.” If you have an off day or even an off week, just keep your focus on the future, appreciate every non-scale victory, and don’t dwell on any speed bumps. “Start each day with positive vibes to [keep] moving forward — don’t worry about yesterday,” McQuade says.